Who wants free tickets to InfoComm? YOU DO! That’s right! We’re offering FREE TICKETS to anyone who wants to attend the InfoComm show in La$ Vega$. For flights and hotel, you’re on your own. All you have to do is click here to get your ticket. 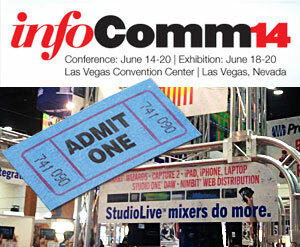 The InfoComm exhibition, June 18-20, is where A/V manufacturers from the world over all converge on the strip, and bring their latest and greatest. It’s where new products get announced and incredible new technologies are showcased. It’s not quite as loud as NAMM, but there is a constant clattering din produced by 30,000 jaws hitting the ground at once when folks get a look at some new curved 3D television or food replicator. We’ve got something brewing for InfoComm ourselves, BTW. Stay tuned to our website and social profiles, or just take us up on the offer and come visit us in person at booth C11341.